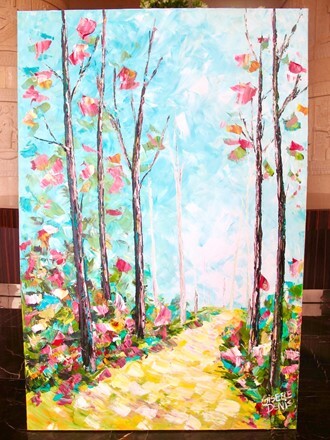 This painting was the first one I made at the Raffles Hotel in Dubai during my 5 week residency. One question I am often asked, "Do you plan your paintings from start to finish & do you know what your paintings are going to look like before you start?" My answer is, "I have a loose plan. But I really let the canvas & the paint & my arm guide me along as I create." I create the way I live my life. I have ideas & plans, but I like to live a little freely & take each day as it comes. I don't plan very much or too far ahead because I'm just not that organized! And also, I like to let life bring things my way & be ok with plans changing. I don't like set schedules where every day of my life is planned & there's no room left for spontaneity. I like my paintings to be loose, free & playful.